Is it possible to get back lost iPhone 6s call history? 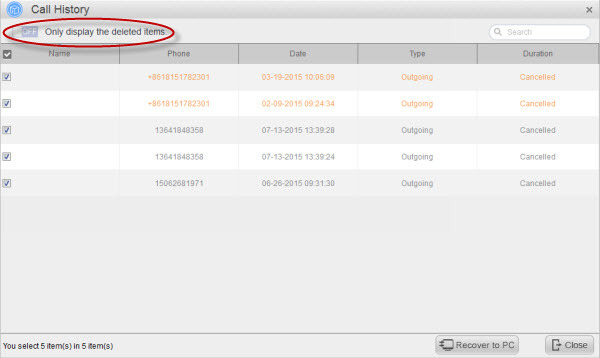 Lost iPhone 6s call history can be recovered from iTunes backup. It is as easy as a few clicks to recover deleted iPhone 6s call history with iFonebox. You will never know how important the call history on your iPhone 6s is unless you find it lost or deleted by mistake. Though there are quite a number of people think there is no necessity to recover the lost iPhone 6s call history, it is strongly suggested to learn a way to get back the lost iPhone 6s call history in case of accidental and irretrievable loss. Sometimes, the call history can be important evidence when you get involved in some legal issues. Therefore, how to retrieve the lost or deleted iPhone 6s call history safely turns out to be a required and essential skill. Most people may choose to restore lost call history from iTunes or iCloud backup. Actually, you are ensured to restore the lost call history from the iTunes or iCloud backup file provided that you have synced all the iPhone 6s data including the call history to iTunes or iCloud and created iTunes or iCloud backup file. However, there is a required step before restoring your iPhone 6s from the backup file, erasing all the content and settings. This can never be skipped. So it is risky to restore the entire backup file to your iPhones 6s just for recovering the lost iPhone 6s call history. Is there any way to recover the lost call history only? Definitely yes! iFonebox, as specialized IOS data recovery software, enables recovering certain data only without causing data overwriting and erasing. You can recover the iPhone 6s call history simply from the iTunes backup file with iFonebox. You can firstly download a trial version of iFonebox to have a try and then decide whether to pay for the full version license. Below are the detailed steps about how to recover your iPhone 6s selectively. Install the full version of iFonebox and get it started. 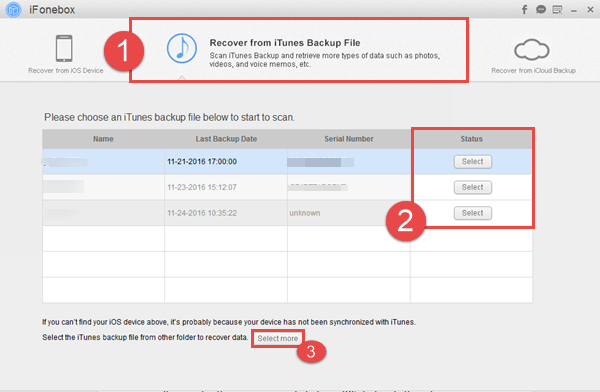 Choose the recovery mode of “Recover from iTunes Backsup”. Then a list of iTunes backup files available on your computer will be presented for your selection. Choose one from which you want to export call history items to your windows computer for record keeping as well as convenient reading. Note: If the iTunes backup file you want does not show, please make sure firstly you have synced your iPhone 6s to the computer you are currently running iFonebox. Then click the button of “Select more” to re-locate the iTunes backup file on your computer. iFonebox supports selectively exporting data of certain category and you can choose call history to exports selectively simply clicking on the icon of Call history. And you don’t need to mess up your iPhone 6s data with iTunes or iCloud at all. It will take some time for iFonebox to scan and analyze the data on your iPhone 6s, please wait for a while. Please a take a preview and choose whatever you want to export and transfer to your computer after all the call history items are exported from the iTunes backup file for your iPhone 6s.